Note that these are just the raw times from the heats, so it does not reflect the fact that Kowalczyk was bumped down to 6th for a lane violation near the finish. In Davos the qualification round was the slowest by a large margin. Nearly everyone picked up the pace in the quarters and then again in the semis, which saw the fastest time of the day. Finally the pace eased off, bot only a bit, for the final. Jacobsen managed a fairly easy pace in for the prelims and the quarters but was well off the pace by the time the final rolled around. On the other hand, Majdic was putting up consistently fast time and while she hung on in the final better than Jacobsen, she also faded a bit towards the end. 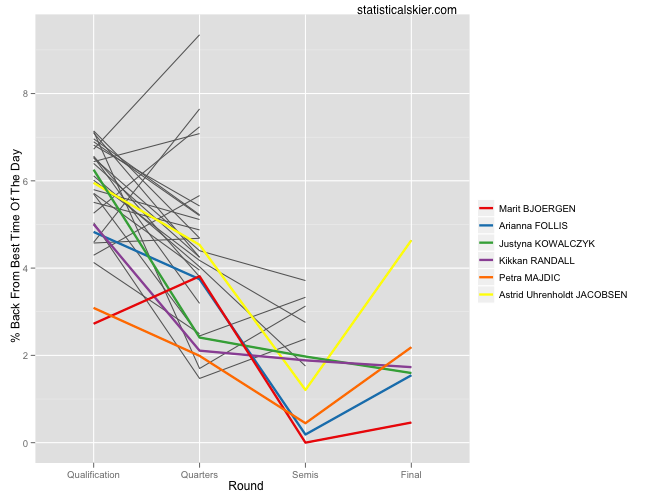 Compared to Randall, Majdic and Kowalczyk, both Björgen and Follis had fairly easy quarters, but then offset that rest with an extremely fast semi. Having just watched the final, it seemed like skis might have been a factor. It appeared to me that Björgen’s skis were running a little bit better than the others, and with a nice big downhill in that course that can make a huge difference. This is a little more typical, I think, with somewhat slower, more tactical semis and finals. Pellegrino laid down an extremely fast time in qualification and then moved on with the slowest time in the quarters (I think). That slow round may have helped him edge into the final ahead of some people who skied considerably faster in the quarters, but by the finals, despite a moderate pace, he was wasn’t able to keep up. Both Jönsson and Petukhov were consistently fast all day, ending up with the two fastest times in both the semis and the final. With that kind of fitness, those two guys are going to be showing up in sprint finals a lot this season. Posted by Joran on Wednesday, December 15, 2010, at 6:00 am. Filed under Uncategorized. 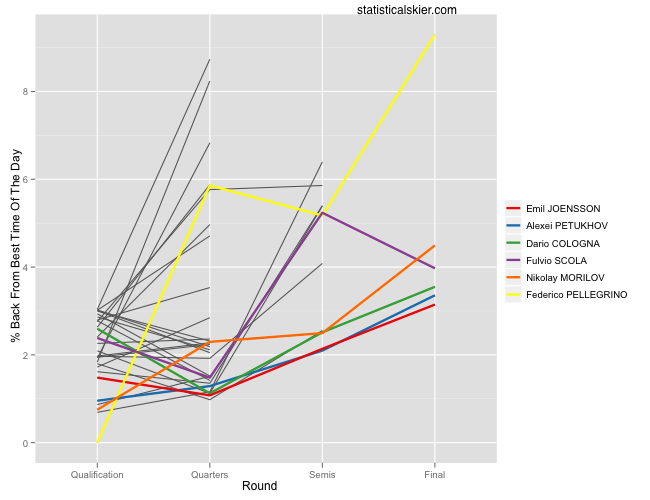 Tagged bump chart, Davos, recap, splits, Sprint, World Cup. Follow any responses to this post with its comments RSS feed. You can post a comment or trackback from your blog.